This was a week for reconnecting with old friends and people who have assisted me in some pretty thunderous ways. Last week, at the 50th birthday party for a friend of mine, I ran into a bunch of people that I had not seen in a while, fabulous musicians who lived or performed in Killington a great deal and have moved on, living elsewhere (some in N.Y.C). It was really nice. One of the more special moments of this fête was that I got to meet a person whom I had spoken to on the phone a couple of times, but never meet face-to-face. He is, by trade, a life and business skills coach, but he is also apparently an unearthly good guitar player and teacher. To give you an idea of how good this teacher is, my friend who turned 50 is a graduate of Berklee, and a monster bass and guitar player, as were all of the players who moved with him from Berklee to Burlington after graduating (all of them but my friend wound up staying). My friend subs on Broadway for one of the guitar players from Steely Dan. He teaches celebrity rock stars how to play guitar (seriously, people you know of). He said this to someone who is already breathing rarified air as a guitarist. Keep in mind that my friend is such a good guitar player that every time I watch him play, I come away with a year’s worth of work to do. Nothing has changed my playing more than the three or four years that this guy was my accompanist and producer. Just watching him play along with me is a stunning experience. The first time I played with him I had to stop because I was giggling with joy. Luckily my friend, despite whatever chemical cocktail he was probably swimming around in at the age of 25 in Burlington, actually listened to this teacher. Instead of saying, “Screw you, old man,” he said, “OK, will you teach me?” and they proceeded to spend eight years (let me repeat that, eight years) just working on his right hand! How his fingernails approached the strings. Just that. Much like my guitar player friend, this teacher is such an interesting and inspiring person that the two times I have spoken to him on the phone, it completely shook my outlook on life to its foundations. The way I approach relationships, the way I approach life, all of that comes down to two 20-minute conversations with this guy, and one other meditation teacher from way back, my first time through college. Being reintroduced to him makes me think that perhaps I should try working with him. It might be time. He has done wonders for all my professional musician friends. Pip (my rescued neglected/abused guinea pig, whom I nicknamed “The Impaler,” for those uninitiated) continues to be on an interesting journey. He slipped back into a digestive bug, so I have been treating that, and since the treatment has taken effect, he is once again friendlier, letting me pet him, purring, etc. It is nice while it lasts, and even though his behavior is not great, it trends to the better. When I think back to how he was when I got him, he is an entirely different guinea pig. I will keep plugging along and see what I can make of him. I write a lot about how much I love riding the chairlift with people. I find it really interesting meeting them, and I love how you meet the real person, never really seeing their faces. This week I sat on the chair with someone and we got to know each other a little, and he revealed that he was a retired fireman from down around the city, and I suddenly knew to whom I was speaking. “Hey, about three years ago, over at Pico, did you help a skier who hit a tree?” I said. “Oh my gosh, yeah, he was wearing teles, I unhooked his skis, he was kind of hung up on trees,” he said. “That was me. Dislocated both knees and a shoulder (avulsed really, but temporary dislocation is easier to understand),” I explained. “Yeah, you were pretty out of it,” he added. Our conversation went on from there. It was pretty awesome to see him: I didn’t ever expect to see him again, and it was nice to be able to thank him. Now if I could just reconnect with the ski patrollers who helped me down the mountain. … One of them went off to war, Marines I think, but as was said earlier, I was pretty out of it. I think about him every day and hope that he’s OK, that he is home, and that he got to ski the six inches of gorgeous blower powder that I did this morning. 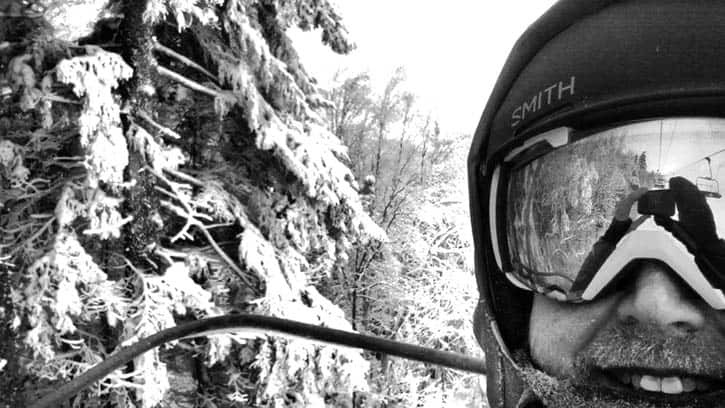 Brady Crain takes a selfie from the chairlift while reconnecting with someone that had helped him in the past.